Hans Pool’s Bellingcat: Truth in a Post-Truth World follows the diehard band of brothers (yes, there are no citizen journo sisters featured) behind the online investigative outfit Bellingcat, founded by a shy Brit determined to unmask some of the media’s most notorious blockbuster stories. Whether that be through geo-location mapping, voice analysis, drone imagery, or even fact-checking legacy organizations like the NY Times (one of several outlets to report a staged car bombing as real), the international collective takes tools once the province of law enforcement and other paid “professionals” to separate fact from fiction in a very 21st century way. Filmmaker spoke with the Dutch director right after his doc’s US premiere at SXSW, and prior to the film’s CPH:DOX opening on March 22nd. Filmmaker: So what made you want to do a documentary about Bellingcat? Was this project in the works before Brexit, Trump and the global rise of the far right? Pool: It all started with an interview I read with a member of Bellingcat in a Dutch newspaper. He had researched the exact location of a brook that was in the background of an image of a rocket launcher and figured out that it was the one that had shot down the MH17 passenger plane over Ukraine. He was just an ordinary guy with a family and he did all of this from his “man cave.” It was fascinating to see the open source internet being utilized like this. I thought this is someone doing something really important. So I got in contact with him, and he told me more about Bellingcat and how the founder is an English guy named Eliot Higgins. Eliot travels a lot and when he was in Amsterdam I met him. I asked him about doing a documentary about Bellingcat and he said, “Let’s do it.” This was about two years ago. Their first breakthrough was the investigation into the MH17 in 2015 — so this was some time before Brexit and Trump. Filmmaker: Can you discuss how you got financing for such a globetrotting shoot? Is the doc mostly Dutch government funded? Pool: The film was financed by different funds such as DocSociety, the Dutch public broadcaster VPRO, and different grants. Our production company Submarine produces a lot of films internationally, but in this case we had to make this film fast due to a deadline from the broadcaster. Thus we decided to not take on any additional co-producers. 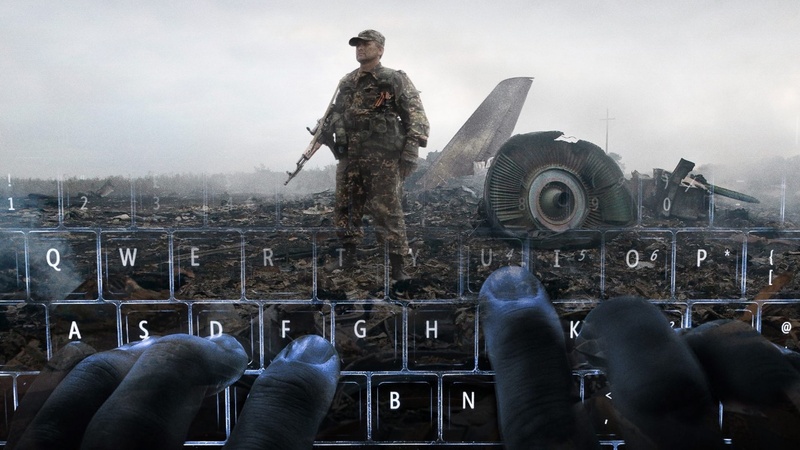 Filmmaker: Since the organization’s work takes place online, was it a challenge to bring the Bellingcat story to light in a visual and more cinematic style? Pool: That was a very big challenge for me. I had to tell a story about five guys working behind computer screens. To bring everything to life was really hard. I filmed everything that was even a little bit exciting to me in a cinematic way. If there was an opportunity to film them doing something other than behind screens I took it. Only Eliot wanted to be filmed at his home, with his kids and wife. The other Bellingcat guys did not want to be filmed with their families because of safety issues. But I was very persistent, and finally with Timmi, the German Bellingcat member, I was able to film inside his house with his daughter. It was important to me to show that these are regular guys with families and kids, who take on risks to investigate cases that are important for all of us. Filmmaker: I was a bit surprised that so many of these citizen journalists were so transparent about their own offline lives, especially when it came to the places they reside in. Did you have to take any precautions to ensure the safety of your subjects (or even yourself)? Pool: In the last couple of years I have filmed a lot in Russia. I was arrested in the south of Russia, and then in the north of Russia they damaged my materials. It was definitely in Russia that I started to feel the most scared. Outside of Russia I never felt afraid. But with the Bellingcat guys I asked them many times, “Don’t you feel scared?” But they said no. However, they did still take measures to protect themselves. For example, for everyone other than Eliot I was not able to film exteriors, and sometimes had to film them in an Airbnb as they wouldn’t let me film their private space. Timmi was filmed inside his home but I wasn’t allowed to film the exterior. Filmmaker: It also struck me that Bellingcat is an all-male, mostly white European organization — or at least its core is. Is this the case, or were these just the people willing to go on camera? Pool: Bellingcat is definitely trying to get in more female members. They are conscious of wanting to diversify their ranks, and they do have female and minority representation now.